Sweden’s Nekrokraft performs a very Dissection laden take on the black metal genre. Though there are nods to thrash and death metal here as well, it is this style that they stick most prominently to. The music is full of highly impactful riffs and nice guitar solos. There is a decidedly dark aura to the music the band performs and makes for an overwhelming atmosphere. The various elements of each genre that the band brings to the table are nicely balanced and stick out in their individual manners. For example, the death aspect of the band recalls the likes Vital Remains, the thrash aspect Kreator and the black aspect of course Dissection. The manner in which the band puts various elements together to create a greater whole is commendable. Still the band would have a hard time toppling Dissection and it shows in the somewhat dated riffing they utilize. Even though it is exciting, there is nothing overtly new going on and this brings the album down a bit. The band is very tight and coherent on this release and bring a good deal of substance to various genres at the same time. The riffs are meaty and make for a huge impact. Though it isn’t anything breathtakingly new, the music has the right amount of ferocity and depth to capture the listener’s attention. The dark riffing is also quite memorable and will ingrain itself in your mind. There really isn’t many other releases of this nature out at the moment so it would be best to investigate Servants. One must also not overlook the intensity of the album, which is partially what makes it so effective. It’s nothing particularly original, but it is full of density and chaos throughout. 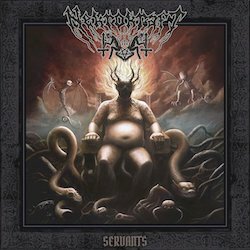 Servants gets recommended to fans that would like to see black metal mixed with thrash and death metal effectively.